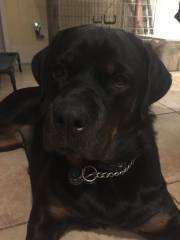 My name is Donato DiMola Jr and I purchased my Rottweiler named Roxy Von DiMola, akc#WSO8494306 on 9-15-04. 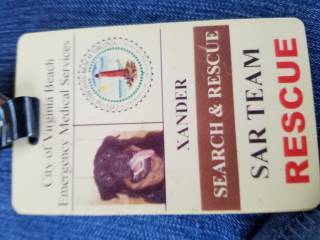 The Sire was Kaiser Von Raven#WRO4424507 04-03 akc DNA#V262454. The Dam was Hill Top Queenie WP98393505 11-01. Breeder Levi L Stoltzfus. I had the pleasure of owning Roxy or shall I say Roxy owned me. She brought me 8 year's of joy and happiness before one day she rested her head on my chest, took her last breath and the good Lord called upon her. Although Roxy had some medical issues it destroyed my world and sent me in a serious state of depression in which I'm still under the care of my Doctor. Kimbertal kennels ( Lisa) warrantied the lose of Roxy with another Rottweiler puppy several months laters. I named her Nicky. She was full of life and love, always wanted attention. Although I was happy to have Nicky, I called Lisa and asked her if she would take Nicky back, and she did. The moral of the story is that I'll never get over Roxy and depression is a disease that I'm ashamed of for people, employers and at times co-workers exploit to humiliate a person to make themselves feel greater. Anyone's looking to purchase a pet, I can say from first hand experience, Kimbertal kennels and breeders are the BEST of the BEST. Lisa thank you for having been understanding with me when I gave Nicky back and for being a kind human being. I look forward to seeing you again soon. Roxy: " your always on my mind and forever in my hear" Happy holidays to you all. I was unpacking boxes today and found this. This was our Kimbertal Rottweiler that we got in 2000. We just wanted to give you an update on Rosie (D94B). She had a heck of a long day with all the air travel to Fresno, Ca. 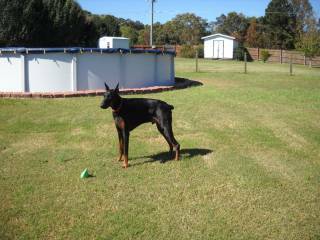 Our family wanted you to know that we all love Rosie and think she is one of the prettiest Dobermans we have owned! She is lively, smart, and she has adjusted very well with her new environment. We immediately started leash training and she responded excellently. She is a very quick learner and now knows what she can bite and what she can't. The house breaking is going great. So far, she is doing great. Her demeanor is great! She is confident and she is not afraid of new sounds and is well behaved in her kennel. I thought our first night with Rosie might be filled with a lot of crying and howling, but she only cried and howled for 10 minutes then she fell asleep and slept through the night perfectly. What a blessing that was! We are so happy with her. Thank you for your help and answering our questions. We pray that we have many, many years of great memories and health with Rosie. Thank you! Love this boy!!!! Finally, You must say by now. That's if You even remember me because it has been forever since I got to use the Computer. Much has happened since I last wrote You. In the Winter Month we have been deserting northern Michigan for sunny northern Florida. The whole Family piled in the Motor Home, Mom, Dad, cat sister Fe; and smallest Ferret Sister, Belle and of course Yours truly. Id did have Fun in Florida, Mom not so much. She said she missed the Snow and that it just didn't feel like Christmas without it. Since I dod get lot's of Presents I thought it was just fine and did not understand what she was complaining about. I got lot's of Rest, soaking up the Sunshine because there were hardly any Squirrels to chase. Everyone in Florida was very nice to me and kept giving me lot's of Pads and even Treats, only with Mom's Approval of course. I even got to visit a Adult Foster Care Home because, as the Lady said, she had never met a better behaved and sweeter Dog than me. That put those wet Drops I don't understand in my Mom's Eyes. Time went by fast and we had to start back to Michigan. But on the Way we stopped at my Human Brother (Mom's Son and only Human Child) and his Family's Home near Atlanta, Georgia. They all loved me there and gave me this huge Yard to run around in. I am enclosing a Picture of it. Also one of me lounging on Dad's Bed, hope You like them. Just in Case You might be wondering, I am being fed well here, I weighed 108 Pounds just before we left Florida. Dad says he knows that I gained Weight since. But, I am not fat, Mom sees to that. She likes me smooth and muscular, no unnecessary Bulges for me! Being back in Michigan Mom had some Health Issues and is using a Walker right now due to a bad Hip that needs replacing. I still get all the Exercise I can handle with my Dad and in our own big Backyard. Hope You are doing well and keep making many more People happy with Your beautiful, loving Doberman. Hello from Atlanta where Luca (almost 15wks) has really great ear accomplishment! While it's not an easy task it's worth it (to both handler and pup!). He's weighing in over 40lbs and has an incredible personality, sweet spirit and extremely smart! We've managed all basic obedience and are starting Schutzhund this week. He's incredible and I'm looking forward to my next Kimbertal pup (female red) that we could plan to breed. Attached please find a picture of my wife and I with Kimbertal's T-Man's Duke of Memphis----"Duke". Whelped 7/27/2013 He is an absolutely wonderful animal. Obviously a beautiful dog, but also very intelligent, well behaved, responds quickly to training, is great around other dogs, and is wonderful with our 2 year old grandson. 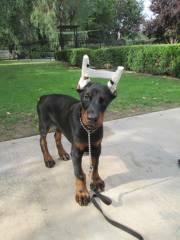 We are extremely happy with our Kimbertal Doberman and recommend the kennel every time we have the opportunity. Thanks so much for this wonderful member of our family. Just wanted to let you know our Daisy turned one today! She has an exceptional temperament and a personality to match. She has become such a big part of our family. She is so great with our three year old son, they are inseparable. I couldn't ask for better. She is our third from Kimbertal and once again we are so very pleased, thank you again for another great dog.